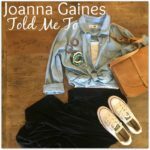 Last month I started a Joanna Gaines Told Me To series, and it was a big hit!!! I’m definitely not the only Joanna Gaines fan out there. 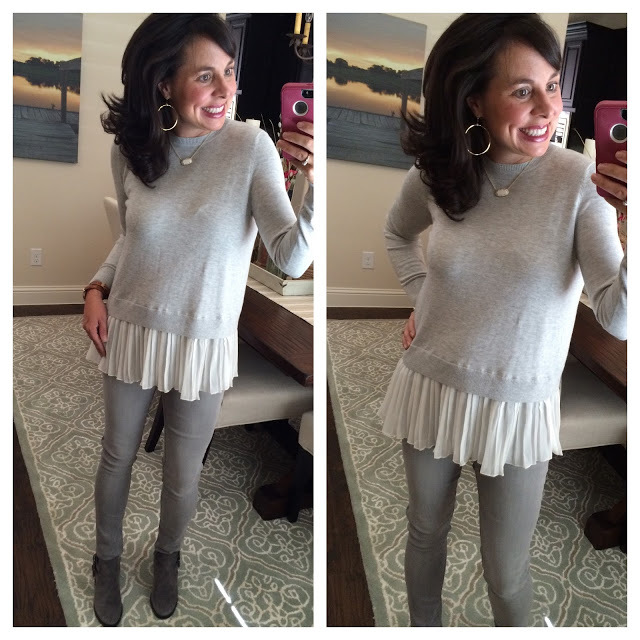 My first outfit I recreated was a simple grey tee and brown leather jacket with jeans. 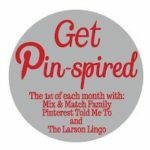 This is my Joanna Told Me To board Pinterest board, which contains some of the outfits you’ll be seeing in the coming months! 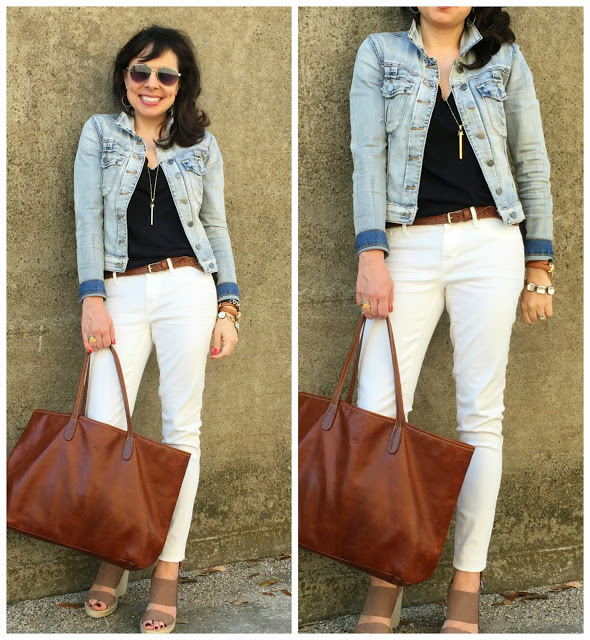 The outfit I’m recreating today can be found in the top left of the below collage. It’s one of her classic looks. Just click it if you want to see it better! I laid out the look I was going to recreate, and I immediately loved it! 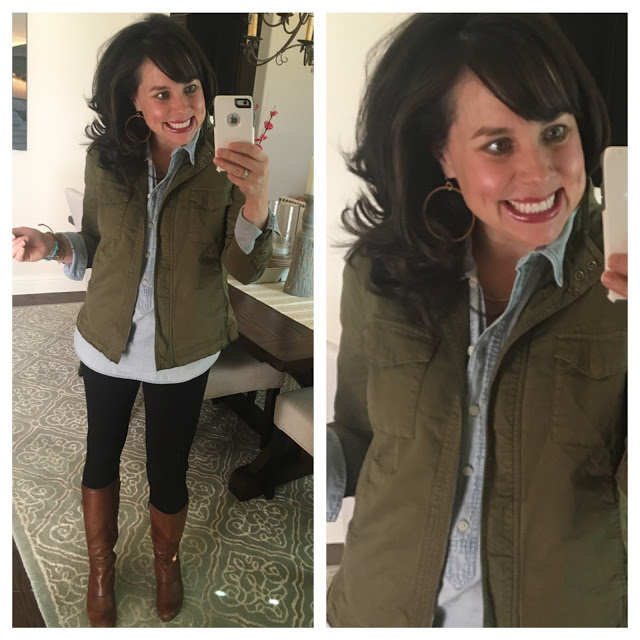 You know I am totally and completely crazy obsessed with love military jackets, and I thought it was a great look to pair it with a chambray shirt and black pants! 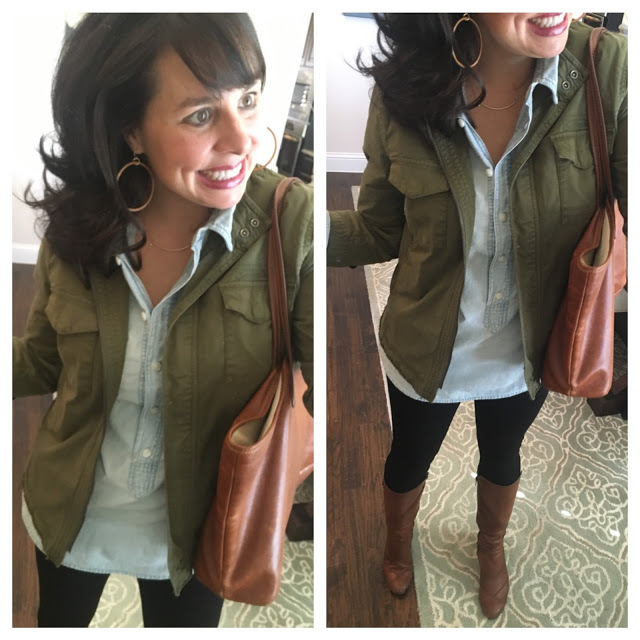 This outfit was a great excuse for me to pull out my new military jacke (that is NOW ON SALE!) yet again. And the black pants were a nice break from my blue jeans that I wear almost every day. Everything that I’m wearing is currently in stock, except for my chambray popover and the boots, but I do have a couple of options for you below. And I grabbed my Barrington leather tote before heading out the door, which is pretty similar to the one that Joanna carries. Here are a couple of chambray shirt options. 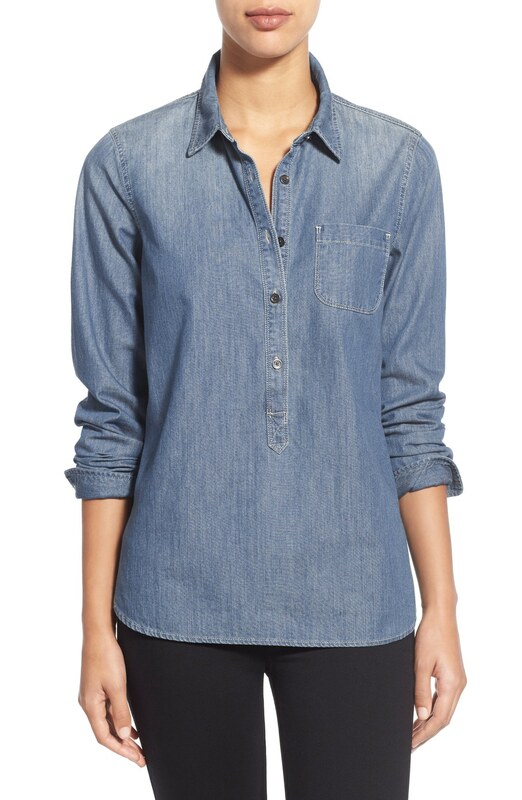 This one is a darker denim, but I love that it’s a popover. Click HERE for the similar option I featured in my links above, it has a very similar wash to mine. Okay….now on to military jacket options. 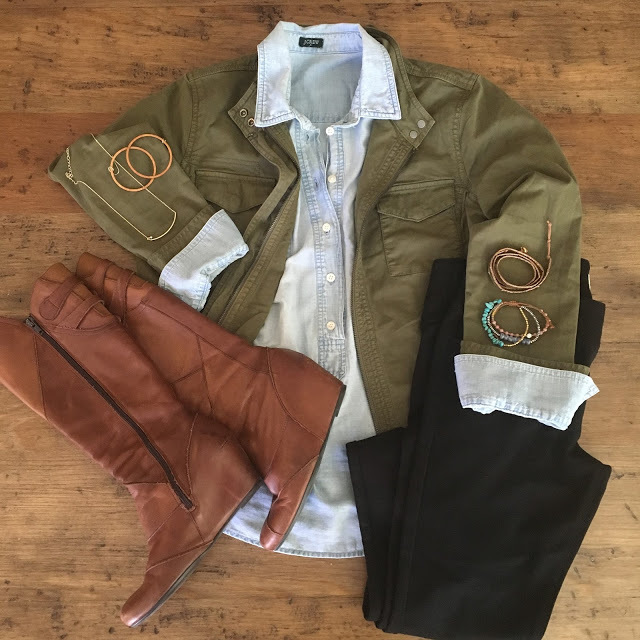 Military jackets are definitely a MUST HAVE in my closet, and THIS ONE is my new favorite! I think everybody needs at least 1 military jacket (I have 4 myself, don’t judge. 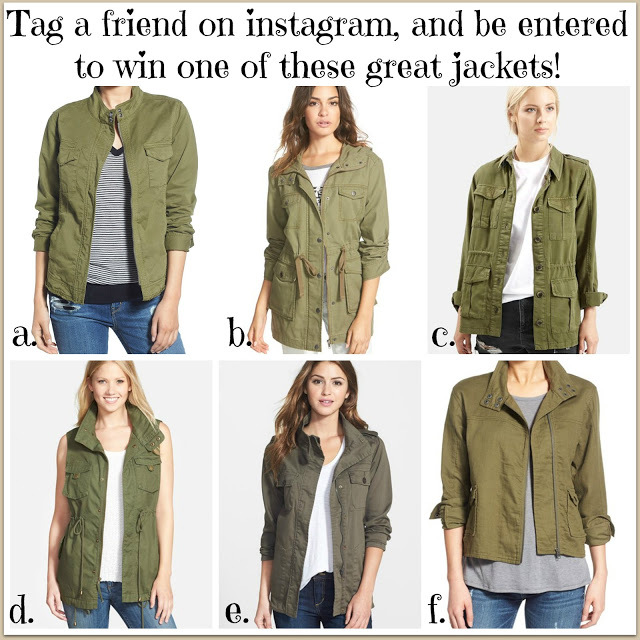 ), so I’m hosting a quick and simple little contest on instagram today for one of the military jackets below (based upon availability of the winner’s size). To enter, just head to my instagram (after 6:15 a.m. this morning), look for the picture of me in the outfit above, and just tag a friend! Each tag you leave, you can be entered again! (To be clear, if you want 10 entries, you need to leave 10 separate comments with 10 separate tags….not just one comment with 10 tags). So, go tag your friends and good luck! And another option that was accidentally left out of the collage HERE. THESE are my wood circle hoop earrings. After some online research, I found the etsy shop (WoodKeeps) that makes them for Joanna! Mine are the medium wood, and I have the gold hardware on them. They are very lightweight. And here’s a close up of my bracelets. 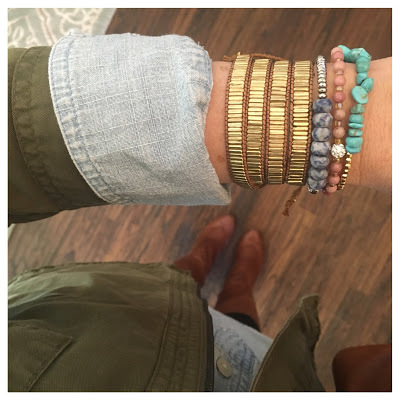 gold bar wrap bracelet / 3 strand bracelet available next week. 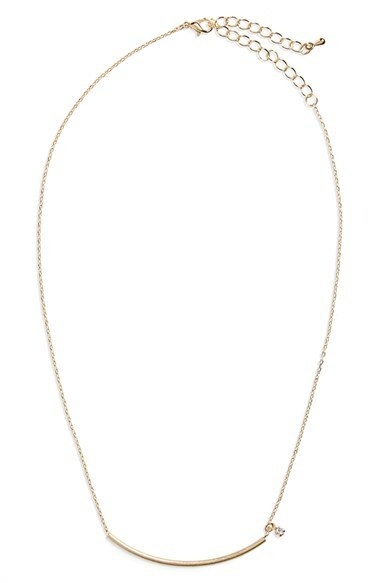 And THIS is the necklace I got for myself several weeks ago. 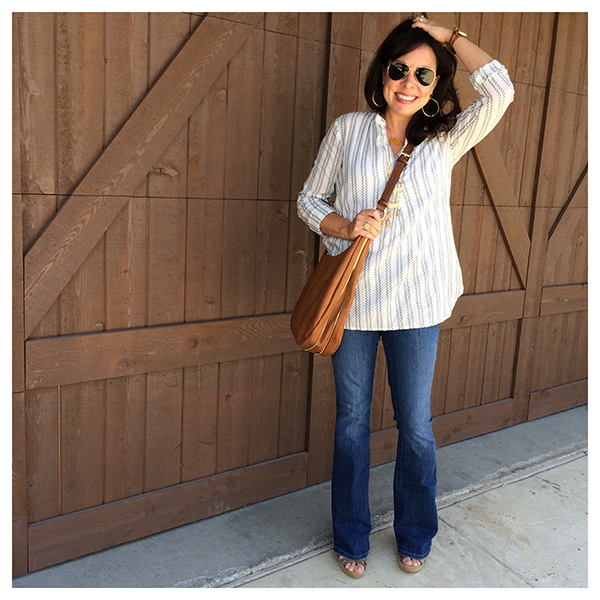 I saw Joanna wearing one very similar on one of the most recent Fixer Upper episodes! And now we need to talk for a second about the pants. FIRST OF ALL, THEY ARE $39. which make them look like more of a pant than a legging. Many readers purchased them when I first ordered them several weeks ago, and from comments that I’ve received on the blog and facebook, it seems that people are really liking them! They are certainly wayyyyyyy more comfy than jeans! Click HERE for the pants. For size reference, I’m wearing a 5. Sometimes I wear a 5 in juniors pants and sometimes a wear a 7, and the 5s were good for me in these. 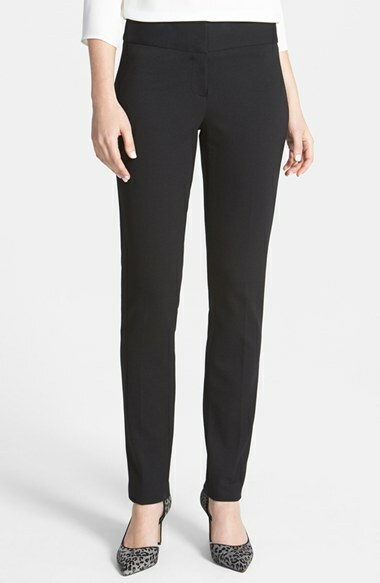 Click HERE for a pair of ponte pants in women’s sizing. FANTASTIC reviews and perfect for an office environment, and they come in 4 colors! And if you want a better look at my leather tote, here it is with me in a picture from last Spring. That’s all for today’s outfit! And remember, if you missed my first Joanna Told Me To post, you can click HERE.Before you go, if you were wanting my new spring UGG boots, but they were sold out, they are now fully stocked again at Nordstrom! You’ll find a full review of these babies in THIS post. And if you follow me on facebook, then you saw this yesterday afternoon. This was one of my favorite purchases back from the Anniversary Sale, and it’s now available in a light pink! So pretty! It’s really light weight, so it’s actually a perfect spring sweater! I would recommend sizing down (I’m wearing an x-small here). You definitely need to wear a cami with it because the back is very sheer. You definitely want to check out the back! Okay, see y’all back here on Wednesday for the Bachelor recap! And don’t forget to head over to my instagram, and tag as many friends as you want for entries into the contest for one of the military jackets featured above! I love this series so much! Like seriously, seriously LOVE IT! Wahoo!!! I need a new military jacket. Either mine shrink or I got taller so I'm headed to IG now!! I love this outfit!!! 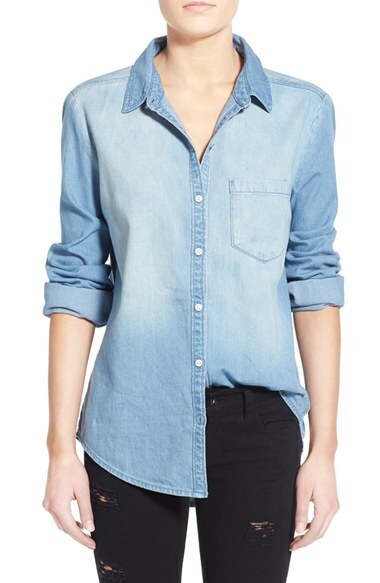 You should check out the lou & grey chambray easy shirt. It is perfect and SO soft. I've been living in it since I got it a couple of weeks ago!! What a cute outfit! 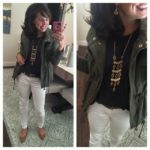 I love all things military and that jacket is at the top of the list! Love it all! What size wooden earrings did you end up getting? I saw that you said yours are the medium colored wood but then I saw they offer three sizes. Thanks! Love Joanna, love you, love this series! So fun. I need to check out those black pants too. My friend Blair was telling me how much she loves them too! Just in case someone else is having trouble…I called and they did say they are having trouble with registered guest and they are working to correct it. They said to check out as a guest until corrected. Thanks for the update Lindsay! You did such a great job recreating that outfit!! So cute! I'm wearing the jolt pants right now and they are so comfy! I never want to wear jeans again. So cute!! The real question is – does Joanna know she has inspired this series yet?? I wanna see a meeting of the two of you! I doubt it Leigh….but OH MY GOODNESS I would LOVE to meet her! 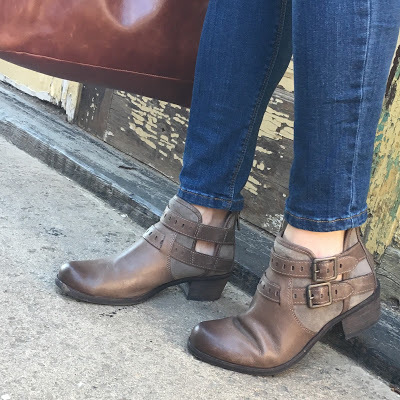 Are you Miz Mooz boots true to size? I found some online and want to make sure I'm selecting the correct size. 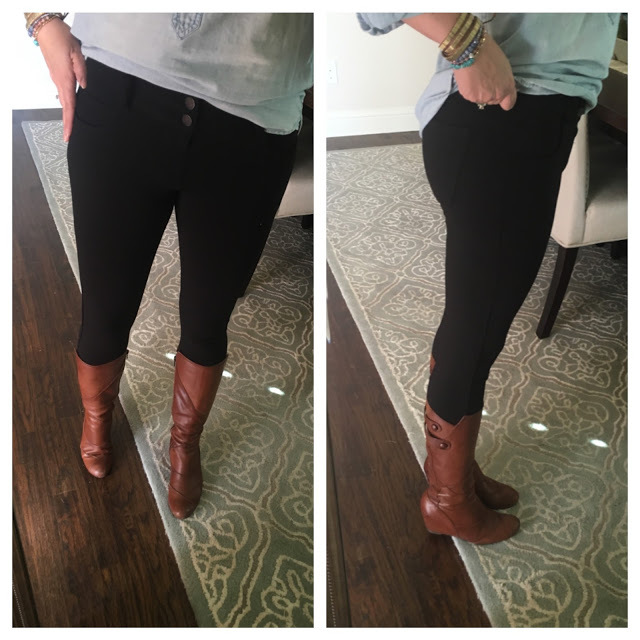 Do you know if Zella slim fit leggings fit differently than regular live in?? I was at the Warsaw Carnival that was shown in last nights episode of the bachelor. 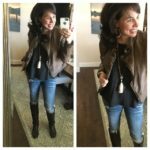 I would love for you to check out my post! adorable and yes who doesn't love JoJo???? My husband and I both adore Chip too!! There are totally the perfect couple. I love your choices, you are spot on!!! 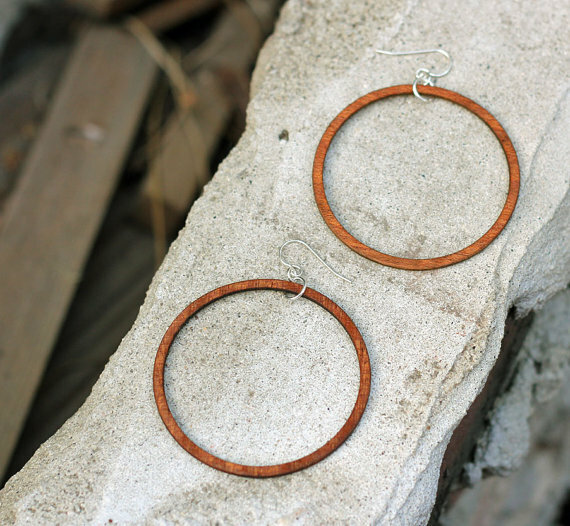 I bought those wood hoop earrings as well and love them! I wear them almost daily and they're lighter than air. Are your hoops perfectly straight? Mine are pretty wonky – if I lay them down on the table you can see how crooked they are. Maybe that just goes with it being natural wood? Hi! 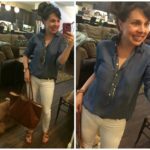 I’m wondering if you know where to find a shirt Joanna wears on season 3, episode The Bardominium – it’s a blue and white baseball T and it’s just gorgeous – it’s when she’s antiquing with Chip. Any help would be great – she also wears it in Orange and Gray, and I’ve had no luck finding it! Hi Kat! I don’t. So sorry!